The 2013-2014 American Indian Graduate Center online scholarship application is now available. Click here to find out more and apply! For questions, email fellowships@aigcs.org. Participants will identify strategies to improve communication between AI/AN patients and health professionals; describe current health issues impacting tribal and urban Indian settings; and improve their understanding of the role of traditional healers. AAIP has a limited number of student scholarships to cover travel, hotel and the registration fee. Visit AAIP’s website to learn more about the workshop and the student scholarships. 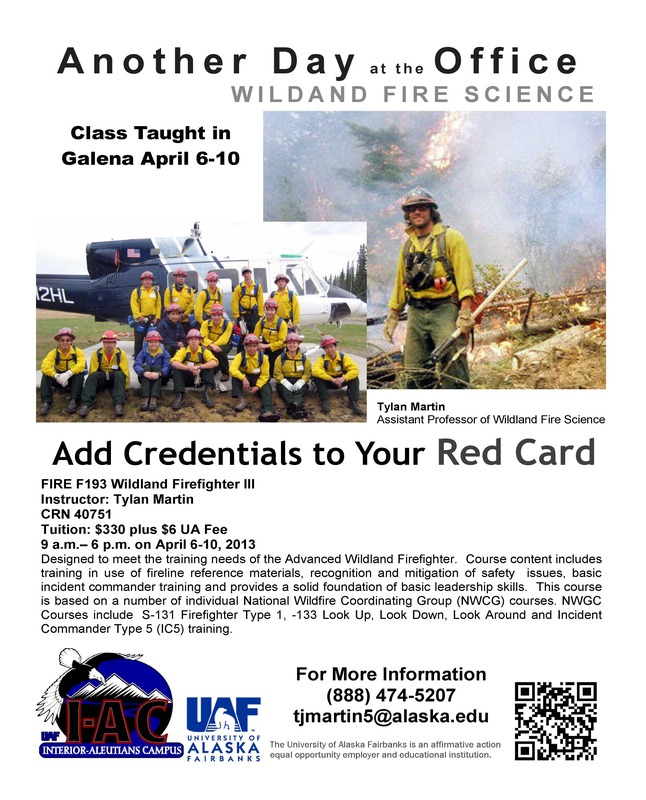 Below are two educational opportunities through the Interior – Aleutians Campus. The 2013 National Health Service Corps (NHSC) Scholarship Program application cycle is now open! The application cycle will remain open through May 14, 2013. The Application and Program Guidance can be found on the NHSC Website and contains all of the program requirements and details. The NHSC Scholarship Program removes the burden of overwhelming educational debt, allowing health professions students to pursue their passion for primary care and serving the underserved. For each year of financial support (up to four years) a Scholarship recipient serves one year (minimum two years) in an NHSC-approved site in high-need urban, rural, and frontier communities across the nation. Scholarship support includes tax-free payment of tuition, required fees, other reasonable educational costs, and a monthly living stipend (taxable). All students applying to the program must be a U.S. citizen or national and enrolled or accepted in an eligible degree program at a U.S. accredited school in Medicine: MD or DO; Dentistry: DMD or DDS; Nurse Practitioner (Adult, Family, Geriatrics, Pediatrics, Psychiatric, or Women’s health); Certified Nurse-Midwife; and Physician Assistant. As in previous years, the National Health Service Corps Scholarship Program will be competitive. If there are more qualified applicants than available funding, the NHSC will continue to prioritize applicants who are from a disadvantaged background and applicants who demonstrate a commitment to continuing to serve communities of need after their service to the NHSC is complete. The Holland & Knight Foundation recently announced the launch of their 2013 Young Native Writers Essay Contest. This is a writing contest for Native high school students (grades 9-12) and is designed to encourage young Natives to write about the progress of their tribal communities and how their communities can keep moving forward. Five first-place winners will receive an all-expense-paid trip to Washington, DC (July 15-19, 2013) and receive a $2,500 scholarship to be paid directly to the college or university of his or her choice. Click here for more information on this year’s essay prompt, contest rules, and prizes. The Winter Bear Project is seeking actors for upcoming statewide tours of the play The Winter Bear, by Anne Hanley. Acting experience is a plus, but not necessary. There is pay. The Winter Bear tells the story of an Alaska Native teenager who rises above trauma in his past to become a leader with the help of mentor Sidney Huntington and a Winter Bear. Want to be featured in a Doyon Foundation profile? Would you like to be featured in a Doyon Foundation student or alumnus profile? If so, take a few minutes to complete our short questionnaire! Find the student profile questionnaire at http://fs8.formsite.com/doyonfoundation/StudentProfile/index.html and visit http://fs8.formsite.com/doyonfoundation/form10/index.html for the alumnus questionnaire. You can view our past profiles at www.doyonfoundation.com/static/profiles.aspx.